Whatever your House Words are, be they Winter is Coming, Hear Me Roar, Ours Is The Fury or Fire and Blood, let there be no doubt that you’ll be able to celebrate them in style with these awesome Game of Thrones House Shot Glasses. 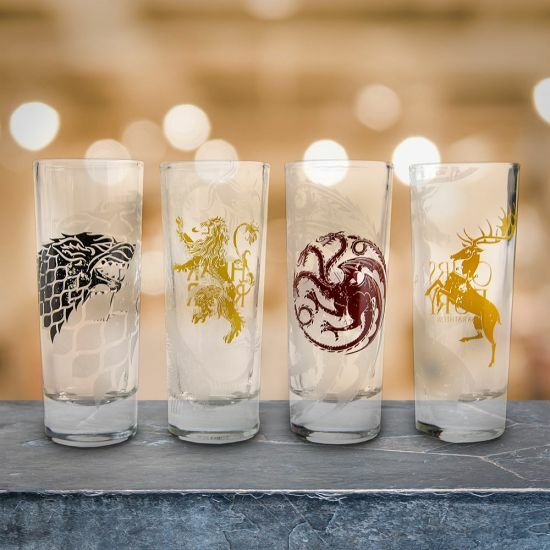 Each shot glass has a colourful logo of their respective house on it in corresponding colours – grey for the Starks, yellow for the Lannisters and Baratheons, and deep scarlet for the Targaryens. Each glass also comes with the house words of each family on the reverse, so that you can recite them as you drink. Ideal for any Game of Thrones fans who enjoy a good drink at home, and perfect for any occasions (including weddings of all colours) never forget your house words with these awesome shotglasses.